Smith, the world’s leading manufacturer of commercial electric vehicles is launching a zero emission truck in the North American market. The Newton is the first vehicle in its class that can compete with the diesel equivalent – but without the polluting effects of tailpipe emissions such as nitrogen oxide; particulate matter and CO2. The Smith Newton, earlier post, is the world's largest high performance electric truck, weighing in with a Gross Vehicle Weight (GVW) of over 24,000lbs. A bank of four suitcase-sized, “Zebra” 278v Sodium Nickel Chloride batteries and a 120 kilowatt motor quickly propel the vehicle up to its top speed of 50mph. The Newton can accelerate from 0-30mph faster than the equivalent diesel-powered truck. It is equipped with regenerative braking and has a range of 150 miles. The Newton’s body panels are built from an ultra light, state-of-the-art fully recyclable composite material manufactured by Omnia. The panels, are a plastic honeycomb material said to weigh around 65% of GRP of the equivalent strength. This substantially reduces body weight and increases the payload capacity by as much as 7480lb. The vehicle has a payload capacity of up to 15,800lbs and is available in US truck Classes 5 through 7. 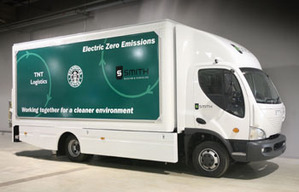 Kevin Harkins, Sales Director for Smith Electric Vehicles, stated that although automobile manufactures believe that battery technology for mass-produced electric cars is some years away, Smith believes that for larger sized commercial vehicles the technology available today is perfectly suited. Smith Electric already has a 70,000sq ft facility in Fresno, CA, which has the capacity to produce 1,000 vehicles next year. It plans on establishing a major production facilIty in the U.S. with the capacity to produce up to 10,000 electicric vehicles per year by 2010. It has a 250,000sq ft facility in the UK which has the capacity for 1,500 vehicles in 2008, but the company is also looking for a larger UK base to take this up to 5,000 vehicles per annum, for the UK and Europe. Smith launched its 2nd generation electric vehicles, Edison and Newton, earlier this year and is on course to ship 250 units in 2007. Customers already signed up in the UK include DHL, Starbucks, the Royal Mail, TK Maxx, and CEVA Logistics, plus many household names yet to be announced. Smith EV is part of a Tanfield Group whose biggest division is the world's fourth biggest maker of powered access platforms, under the UpRight and Snorkel brands, many of which are produced in the US. Many of those are electric too. The share price of Tanfield (London ticker TAN) has climbed sevenfold in the past year. On the EV front they are pressing ahead where others find excuses not to. The batteries in this thing are hot (250 C, I think) and contain liquid sodium and liquid sodium aluminum fluoride. Not bad in an application where they can be kept warm constantly, as in regularly scheduled delivery services. They will have to be kept plugged in when not in use to keep the batteries from getting too cold (restoring them after a freeze could take a few days, if I understand correctly). Magdyno unique, state-of-the-art proprietary one-stop Single Vendor Electric Propulsion System (EPS) solution to the electric cars will play important role in EV/LEV industry. Please refer to www.magdyno.com for details. It is not JUST a battery. Should take entire drive train system into consideration. An unique, state-of-the-art proprietary one-stop Single Vendor Electric Propulsion System (EPS) from Magdyno (www.magdyno.com) is an ideal proposal. The Betard web site is dead today, but the google cache has a paper from 2003 on the Zebra batteries, where they calculate high-volume cost of $100/kWh (assuming $18 for 1.5kg Ni, now ~$40). That's really cheap compared to the $2000/kWh for an A123 plug-in Prius battery, and cheap compared to the target price of $500/kWh for next generation Li batteries. The only problem is energy density-- 160W/kg, vs 1300W/kg for NiMh or LiFePO4, so you need lots of battery to get the needed power. The Smith truck batteries must be about 800kg for the 4 modules. If they could make them for ~$100/kWh, then the battery cost would be <$10K-- not bad at all. At $100-150/kWh, it's cost effective for utility power storage. It takes several days to freeze, not to thaw, and the batteries can take many freeze/thaw cycles. Doing some calculations, it should take 1-2kWh to thaw a 20kWh battery (4 needed). I guess if you had to jump start it with another truck, it should only take a few minutes with some pretty hefty cables (battery power is 32kW/module). However, I just came across a data sheet that says 24h heating time-- I don't know what this means. I saw a quote that it takes 90W/module to maintain the core temperature in the zebra battery, though it seems that adding extra insulation could cut this down. 10cm of insulation would be 10-100W for the 300 deg temperature difference. Supposedly 4-6%/day loss of charge would occur to heat the core when not in use, so it could be parked for a couple of weeks. Charging creates enough extra heat to melt the core. Supposedly, extra heat can be used to warm the vehicle. I don't see much research going on in the US on these batteries. This is an eye-catching article! This is great.! There are lots of inventions now that helps the people and this is one of the interesting one. I'm excited to read that this truck will be produced in the USA. With the economy in the doldrums, this production facility will be a blessing to so many who are out of work, especially those who used to work in the auto industry. Excellent story, I just wonder when these will become mainstream. Trucks Suppliers Network for more information. Really Great. good work, keep it up. Great idea. But this will never take off. Deep down it seems people dont care, its human nature. Sadly. Awesome. Have they improved on the lithium technology? Never seen this one before. Really cool. Well done. It's about time to consider in the Earth's resources run out slowly and go for a serious revolution in transportation. Of course using electric trucks, it's not a perfect solution, but it's better to start from there than to do nothing. I'm also excited to read that this truck will be produced here! That's a brilliant idea to launch electric truck..this will help in controlling pollution to a great extent.Good post!! Nice Truck but we must keep our future green & pollution free! Really Great Idea. It will help in save our resources and make our environment eco-friendly. But the problem will be to produce the battery which could get load of such heavy trucks. That's very good. It's about time to consider in the Earth's resources run out slowly and go for a serious revolution in transportation. Of course using electric trucks, it's not a perfect solution. The only problem is energy density-- 160W/kg, vs 1300W/kg for NiMh or LiFePO4, so you need lots of battery to get the needed power. The Smith truck batteries must be about 800kg for the 4 modules. It will help in save our resources and make our environment eco-friendly. But the problem will be to produce the battery which could get load of such heavy trucks. That's a brilliant idea to launch electric truck. Hey, just dropping in to say thanks for the excellent information! Being from FL, i had by no means utilized tire chains before. We didn't exactly get much snow down there! Very first time I ever needed them was when I moved out to Cali. I do not know why I moved out there within the middle of winter, wasn't exactly a smart concept. It had by no means even occured to me that I might require tire chains once I got closer to California and had to cross over the mountains. Once I got closer to CA and started heading up into the mountains, I observed that everyone ahead of me was pulling over. Then I saw everybody putting their snow chains on. Of course becoming from FL I didn't even have any with me, so I had to buy some off a guy right there on the side of the road. I grew up in Florida so I had by no means even seen tire chains until I made the move out to California. I'm still not certain what I was thinking moving within the middle of winter! It had never even occured to me that I may require tire chains once I got closer to California and had to cross more than the mountains. When I got there all the traffic was slowing down and everybody was pulling more than, I had no concept what was going on. Everybody was out digging in their trunks and getting their tire chains out. I didn’t have any obviously, but fortunately there were vendors selling and installing them correct there on the side from the road! It's about time to consider in the Earth's resources run out slowly and go for a serious revolution in transportation. Of course using electric trucks, it's not a perfect solution, but it's better to start from there than to do nothing. The Smith truck batteries must be about 800kg for the 4 modules. If they could make them for ~$100/kWh, then the battery cost would be <$10K-- not bad at all. fourth biggest maker of powered access platforms, under the UpRight and Snorkel brands, many of which are produced in the US. Many of those are electric too. The share price of Tanfield (London ticker TAN) has climbed sevenfold in the past year. finally an eco-friendly truck!! but does it have the same mileage as with diesel powered trucks? It's about time car companies start making eco-friendly trucks. This would be a great help in reducing our green house. Great article. I think hybrid/ green commercial trucks are a perfect place to adapt the technology because they are so frequently used, not to mention one of the biggest polluters on the planet. True, it's about time our car manufacturers start making hybrid and electric cars. Nice facility. Those type of vehicles can handle the job better. Great post! These machines are awesome! I love what we can do to save energy.. It's really a great information.Today's many automaker concentrate on electric vehicles. Which has been more advantage and very comfort than regular vehicles.Because electric vehicles is Eco-friendly.It's really a great vehicle.Thanks for sharing this nice information. I like the idea of an electric truck used by companies in the US. i find your blog very interesting lots of good post and readable articles. Keep it up i will surely bookmark your site and visit it for future readings! this is an eco-friendly truck but can it match the performance of diesel powered trucks? I can say you have great creativity and clarity on your blogs since you presented each step in a well accomplished manner.This explores my knowledge on various things.Thanks for sharing. Whether you are planning looking for a boom truck, forestry truck, bucket truck, bucket truck, I80 Equipment has what you need. They offer a range of funding opportunities and leasing. i think smithelectricvehicles are not only unique but also environment friendly. Really Great Idea. It will help in save our resources and make our environment eco-friendly.